With the collapse of the West Coast's salmon fishery, thousands of anglers have turned their attention toward other more readily available species such as rockfish, striped bass, and lingcod. 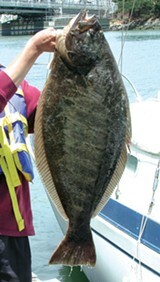 California halibut, though, may become the hardest hit as a result of this so-called "effort shift" — especially now as the two- to three-foot flounder flood through the Golden Gate toward the Berkeley Flats, the South Bay, and other shallow, sandy spawning grounds. Even though California halibut are considered a healthy resource by most biologists, some fishermen worry that the number of fish may subside soon because of the steady pressures of overfishing. That's partly because some sport fishermen are exploiting a regulatory loophole in state law that allows them to catch as many halibut as they want in San Francisco Bay by posing as commercial fishermen. It's simply a matter of paying for the privilege. For just $120.75, any California resident can purchase a commercial fishing license over the counter at any of eight Department of Fish and Game offices statewide. This license allows a fisherman using a rod and reel to keep unlimited halibut. One's boat must be registered, too — a $317 over-the-counter fee often shared among fishermen who use the same vessel. Keith Fraser, owner of Loch Lomond Bait Shop in San Rafael, says he has heard of small commercial skiffs landing fifty halibut a day. But since state law does not require holders of commercial fishing licenses to actually sell their fish, unscrupulous sport fishermen can pretend to be commercial fishermen without fear of being caught. Don Kelly, a Fish and Game warden who patrols the waters of the South Bay, conceded that such activity is an "abuse" of the system, but admitted that it's entirely legal. Sport fishing licenses limit each angler to the use of a single rod in San Francisco Bay waters. By contrast, a commercial license allows a person fishing aboard a registered vessel to use up to four rods at a time and, when licensed crew members are aboard, up to six rods. Fishermen using commercial licenses only have to weigh-in their catch at any of several certified fish receiving stations, report the weight to Fish and Game, and pay a landing tax of 1.25 cents per pound of halibut. Pier 45 in San Francisco is a major offloading point. "Once the fish is weighed and the landing tax is paid," Kelly said, "you can do whatever you want with the fish, whether you sell it or keep it." Berkeley-based party boat captain James Smith Jr., who operates the charter boat California Dawn, said at least "a handful of guys" fish with commercial fishing licenses simply to bring their halibut home. "And there's probably a whole bunch I don't know about," he added. Smith would not name any such sport fishermen for fear of retribution, but said that several of them have "six-figure" jobs. "They don't need to be out there competing with fishermen who are actually trying to make a living," he said. "Where's the justice in that for the guy who's fishing commercially to sell his fish and feed his family?" Party boat captain Bob Moncke has also seen sport fishermen pose as commercial fishermen without intending ever to sell their catch. "There are a lot of guys doing that now," said Moncke, who operates the boat Reel-Lentless out of Berkeley. "In my opinion, they shouldn't be out there. If you're just getting the commercial license to have extra rods onboard or to take the fish home, you shouldn't be fishing." The solution to preventing sport fishermen from entering the commercial rod-and-reel fishery could be simple, Moncke said: "I think [Fish and Game] needs to stop selling licenses and make this a closed fishery. You can't even buy a [commercial] salmon permit anymore, or a crab permit. Halibut needs to have the same limits." Commercial crab, salmon, and other fisheries are called "closed" or "limited entry" fisheries, operated by a fixed number of licensed fishermen, many of them long-time veterans. They may sell their permits to other fishermen or back to the Department of Fish and Game, but new permits are rarely issued. But the commercial rod-and-reel halibut fishery is entirely open; pay $121 over the counter, register your boat for another $317, and you're in. By contrast, a regular sport-fishing license costs $41.50 and comes with a three-fish limit. So how many sport fishermen are posing as commercial fishermen and have upgraded to the unlimited-catch license? "We have no clue whatsoever," Kelly said. Fraser of Loch Lomond Bait Shop believes commercial halibut fishing should be banned inside of the Golden Gate Bridge. Fraser also has spoken to Fish and Game about tightening sport fishing regulations and, in particular, would like to see the three-fish limit reduced to two. So would Smith. However, fishery biologist Travis Tanaka, a halibut specialist with Fish and Game, said any tightening of the sport fishing restrictions is unlikely for now. And Kelly said that the rod-and-reel commercial halibut fishery will remain open to all unless evidence of overharvesting becomes plainly apparent. Smith worries that such a day could arrive soon, and, as he sees it, current regulations have only made plundering of the halibut fishery all too easy. "These fishermen pay this little fee, and they have a license to kill."